While the bulls have had their way with the market since the 667 S&P 500 low set on March 6, there are a number of concerns laying all around the marketplace that will likely limit the extent of this newly found revelry. Without a doubt, since the March 6th pit of desperation there have been a host of good things to reflect upon: Huge sums of cash on the sidelines; a series of hints that the economy is getting…well, less bad; along with widely expected improvements later this year due in large part to the stimulus package have all been very helpful in beefing up hopes of an economic turn-around. On the other side of the coin, however, are a number of reservations cautioning investors about getting too enamored with the current market direction. Recent history has shown that the rules of equity ownership, unexpected politics shifts, the availability or unavailability of consumer credit and the nature of capital needs are far from being clear. These concerns don’t even touch upon the loss of trust that has so greatly muted investor’s confidence. For example, who knows what last week’s much ballyhooed stress test actually meant? O.K. Even if you really want to be bullish, you just have to look back to the influence that the tech crash and 9/11 had on the direction of the S&P 500. 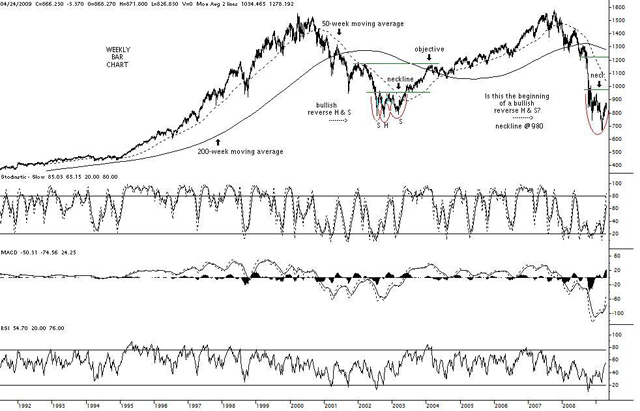 Following a very steep market decline that occurred between 1999 and 2002, a broad bullish reverse Head & Shoulders pattern developed that saw the S&P 500 Index move up and down a few times during 2002 and 2003 before an actual turn to the upside took hold. If a similar scenario were to play out now, the 960/980 area would likely cap the upside of the S&P 500 before a serious retreat back to the lows, or possibly even lower unfolded. Massive debt issuance, rising levels of unemployment, worries over inflation and deflation in the same breath, concerns that a global move toward protectionism are not to be dismissed lightly. Saber rattling in North Korea, rising Taliban influences in Pakistan, jitters over Iran versus Israel and a gradual US withdrawal from Iraq are also “out there”. So are a number of commercial real estate issues. In any event, bullish momentum is still in the driver’s seat …for now. That could change, however, as a renewed move toward capital preservation reemerges later this year. This entry was posted on Sunday, April 26th, 2009 at 7:26 pm	and is filed under The S&P 500 Index (SPX). You can follow any responses to this entry through the RSS 2.0 feed. You can leave a response, or trackback from your own site.